The past 2000 years have not been kind to we Greeks. After creating arts, literature, computers and everything else Western Civilization holds dear we decided to rest on our laurels. After centuries of being subjected to Roman Rule, Ottoman Terror and Nia Vardalos movies, Greeks have decided to come back with a vengeance. Our weapon of choice is bizarre protests. The December riots protested the death of a teen by the police. They were violent but protests at perceived police brutality are a global event. Two protests that took place recently belong in the offbeat news section. On Monday April 6, Dairy Farmers handed out free milk on the streets of Athens to bring attention to low milk prices. Apparently massive government subsidies and a sweet pension aren't enough incentive to work when milk prices are low. 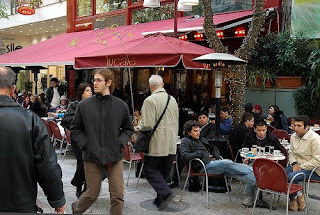 Then on Saturday April 11 an online petition called for a boycott of cafes in Athens. The residents have had enough of the highest coffee prices in Europe. While cafes in Rome, Vienna, Paris and Seattle get all the notice, the Greek Cafe is quite simply heaven on earth. It's a spot where you can sit for hours reading a newspaper and chatting for the price of one coffee. In Greece you pay rent for the chair, not for the coffee. Unlike in those other cities, that chair in the Athenian cafe is a place of comfort. Why would you work, or do something productive with your time like in those other cities? Greeks don't have time to work and for 3 euros a day there is a place you can spend your entire day. While the country teeters toward bankruptcy they're protesting about the cost of a freddo cappucino. Oh Greece that's why I love you!